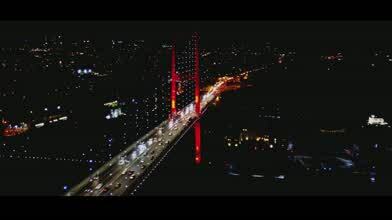 Contributor Tntrmedia brings us this amazing drone's eye view of the Bosphorus Bridge in Istanbul, Turkey. Completed in 1973, the suspension bridge over the Bosphorus Strait is almost 1.6 k meters (just over 5.0k ft) long. It is also known as the First Bridge because it was the first bridge to connect the European and Asian sides of Istanbul. It's now the southernmost of three Straits spans following the opening of the Fatih Sultan Mehmet (1988) and Yavuz Sultan Selim (2016) Bridges.